A new extension to an existing primary school nestles into a secluded bushland site. Austins Ferry is a northern suburb of Hobart, located on the bank of the Derwent River. The addition is to be used by kindergarten and prep classes and for the school’s Launch into Learning programme. Seven new classrooms have been designed for a focus on early learning, including one classroom with direct access to the school's veggie garden. This classroom will provide a hub for encouraging engagement with the garden, where students can cook food with the produce on offer. The form was deliberately broken down into smaller scale structures to utilise the natural contours of the site, ensuring all buildings have ease of access to the playground. 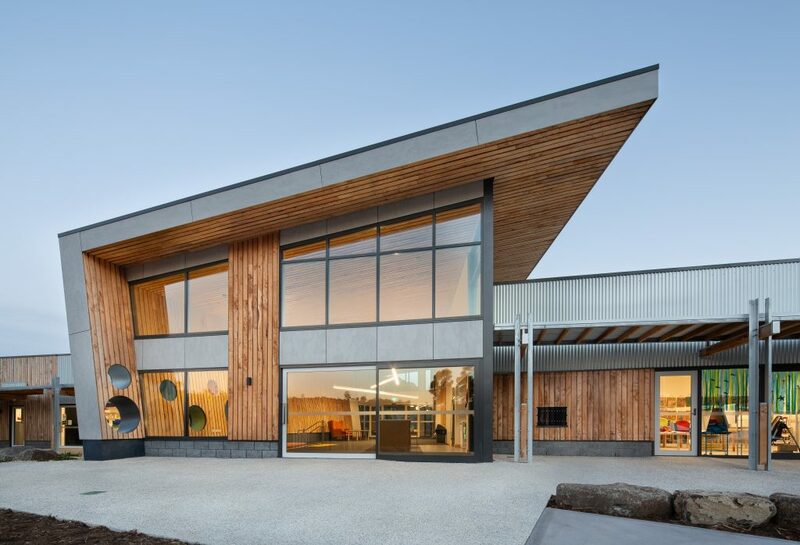 An early learning centre addition to the existing Austin Ferry Primary School outside of Hobart has been realised by Xsquared Architecture. 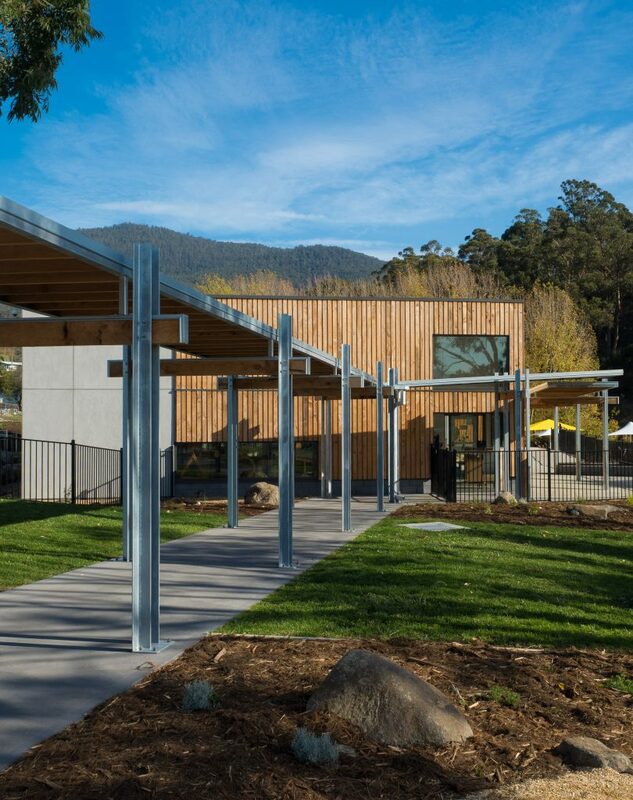 The Hobart based firm designed the timber framed structure to sit comfortably between the native bushland and the school's veggie garden. Original plans to use steelwork to form the double height entrance lobby were designed out to make way for timber construction. Timber posts and LVL rafters were specified with minimal steelwork to create the high volume. Eliminating the steelwork created a faster construction time and kept costs down. 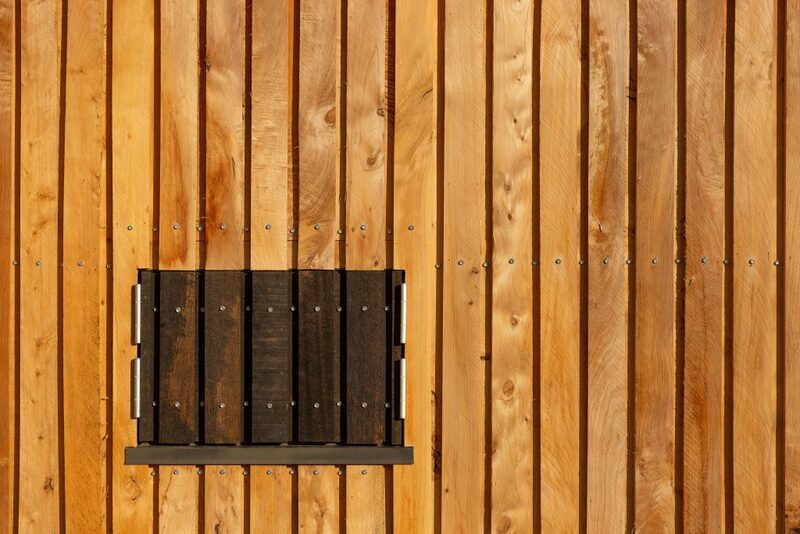 Hardwood and structural pine, along with the macrocarpa cladding were all sourced from the Tasmanian midlands. 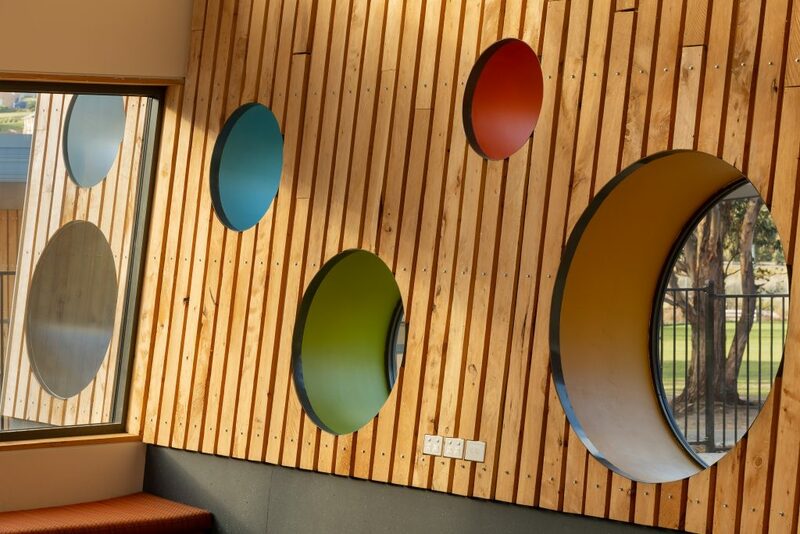 Rough sawn macrocarpa timber boards were detailed with expressive fixings to create a rustic aesthetic and tactility to the learning centre. Choosing rough sawn, knotty timber, meant more of the boards were utilised and saved from wastage. The vertical boards comply with the required BAL 12.5 rating of the site, and match the natural wooded setting. 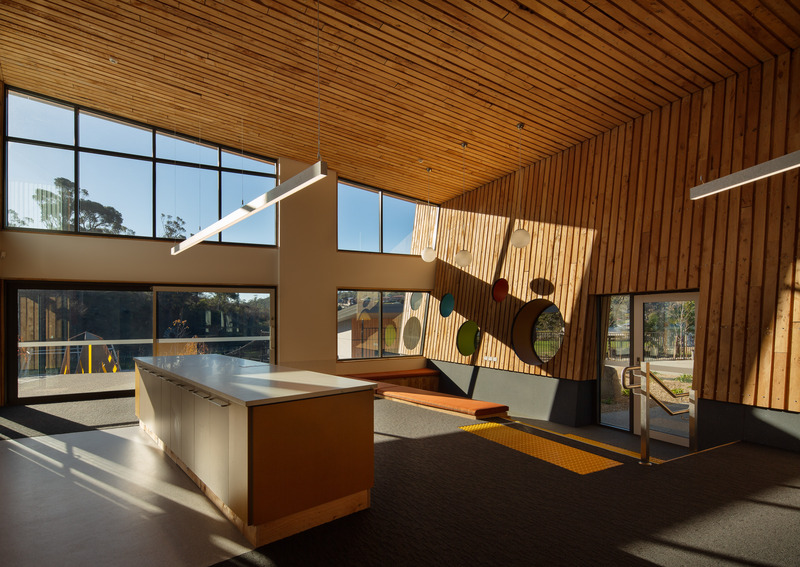 A cantilevered bench seat and specialty puppet theatre window utilised dark-stained blackbutt timber to comply with the extra structural requirements for the BAL rating. The puppet window allows pre-schoolers to undertake shows whilst parents watch on. 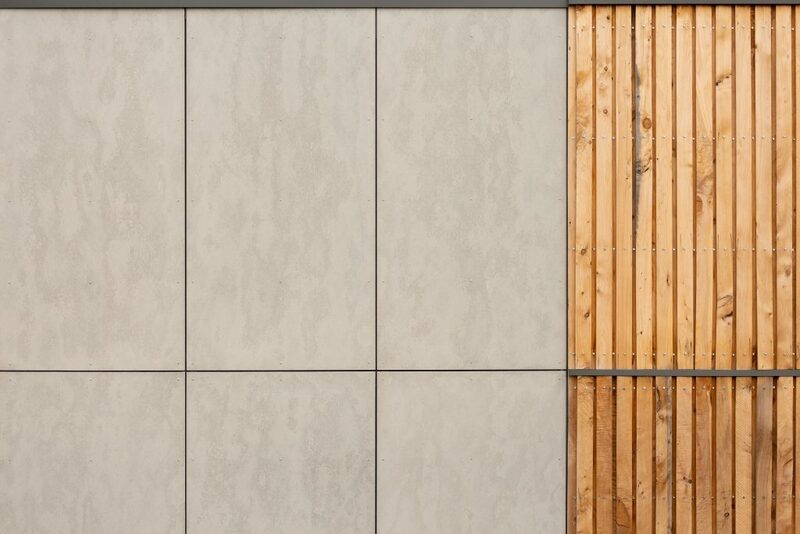 Unfinished cement sheeting was coupled with the timber for exterior cladding. The sheeting was specified for its cost, durability and low maintenance. As the timber greys off, the two materials will sit even more harmoniously in the bushland. The folding roof design exploits maximum daylight from both the north and south facades. Extensive glazing allows heat and cool air to travel through the space, while smaller apertures harness the panoramic views of the bushland. Varied external play spaces flow forth straight from the internal teaching spaces. This opens up the spaces and creates an important external relationship. The internal spaces are also externally linked via a broad covered walkway. Intermittently placed water tanks and water play spaces along the walkway provide a fun and educational experience of water harvesting. The designers wanted to celebrate the educational aspect of rainwater harvesting, whilst also maximum water recycling in underground rainwater tanks. The harvested water is used for toilets and irrigation. 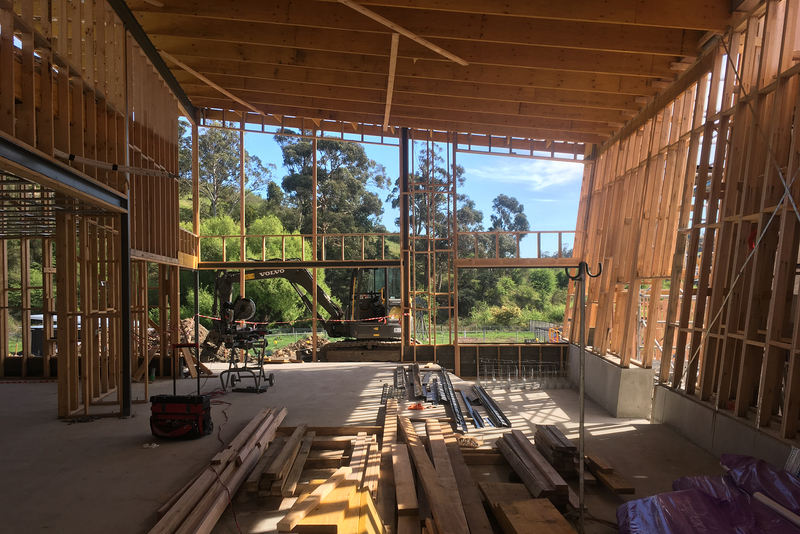 The interior palette continues internally, with macrocarpa boards lining the ceiling and main walls. The tactile material delivers a warmth and texture to the young children. The rich hued timber remains unfinished and undressed, leaving the natural glow exposed to occupants. The articulated roof form creates a canopy overhead, forming a strong and durable ceiling that lightly perches on glazed walls. The space feels simultaneously open and protected. House 28 uses shipping containers as a basis to create a weekend retreat in the wild landscape of Wye River.